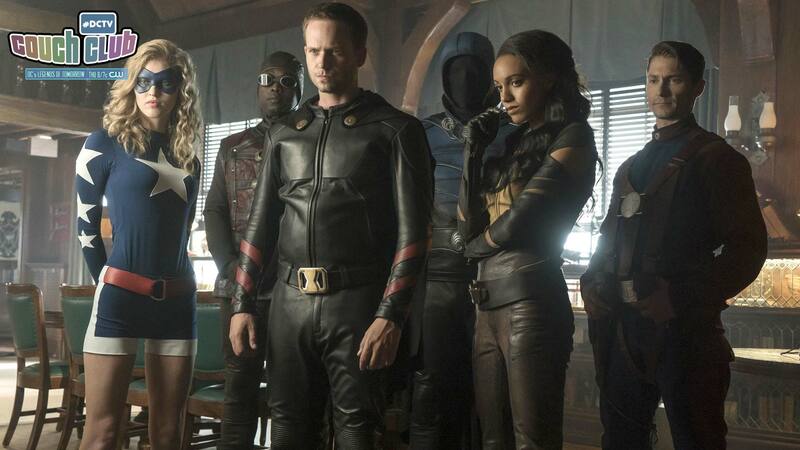 I’ll be totally honest with you guys: The introduction of the Justice Society of America was probably my most anticipated moment across all of the #DCTV shows. I’ve been on the edge of my seat for them since Rex introduced himself at the end of season 1. And now they’re here! They’re a real thing! A live action JSA! How crazy is that? Before we take a closer look at the team line up, let’s talk about the elephant in the room: What on earth is the deal with the JSA and are they just a weird new name for the Justice League of America? What’s going on there? There’s a pretty decent chance that this is your first encounter with the JSA in any form, and that’s completely okay! Don’t panic! This new DC Comics 101 column (written by yours truly) has you covered if you’ve found yourself scratching your head about one of the worlds most confusingly named super hero teams. Now, let’s take a look at the lineup. This version of the Justice Society is made up of Commander Steel, Dr. Mid-Nite, Hourman, Vixen, Stargirl and Obsidian. That’s quite a few new characters too keep track of all at once, so let’s do a roll call. Comics-verse Rex is the first in a long, complicated line of men who take up the Hourman mantle. His superpowers traditionally stemmed from a super serum that allowed him to be imbued with strength, endurance and speed for an hour—his “Hour of Power.” Whether or not his Legends counterpart has these abilities remains to be seen… Maybe. Things aren’t looking super great for Rex’s future, so… That may or may not be left a mystery. Unlike many super heroes who use the “Dr.” prefix in their code names, Dr. Mid-Nite really is a doctor. This usually nets him the position of team medic and surgeon. In the comics, several people all with slightly different power sets have held the mantle of Dr. Mid-Nite. One common thread between all of them, however, is perfect night vision, so it’s very likely that’s something we’ll be seeing out of this incarnation of the good doctor at some point during the show. You might recognize Vixen’s code name and power set—the ability to channel the traits of animals—from Arrow and Vixen’s CW Seed animated series. The Vixen appearing in those shows is Mari McCabe, the granddaughter of Amaya Jiwe, the Vixen we saw in tonight’s episode. Though she’s never been a member of the JSA in the comics (Vixen is actually the only person in this roster who doesn’t have any comic book history with them), Mari has been a fixture of comics since the ‘80s. Amaya, however, is a new creation specifically for Legends. I don’t know about you guys, but I for one cannot wait to watch her snark at Ray Palmer some more. Of course, Amaya isn’t the only ancestor of a familiar face in this line up. Commander Steel, aka Henry Heywood, was revealed (as expected) to be Nate’s grandfather and personal hero. In the comics, Commander Steel was a military man who underwent some pretty intense experimental surgery to bond his body with metal and give him enhanced strength, speed and invulnerability. It doesn’t look like this version of the Commander has any of those powers at his disposal, but he seems to get along just fine without them. We can’t say the same for Nate anymore, though—who knows what the lasting side effects of that super serum are going to be? Prior to adopting the identity of Stargirl, Courtney Whitmore was known in the JSA as the Star-Spangled Kid. Her power set revolves around her Cosmic Staff and Cosmic Converter Belt, which allow her to do all kinds of cool things like manipulate energy (“star bolts”) and fly. It looks like comics-verse Stargirl and Legends Stargirl are almost identical to one another, from their costume designs to their abilities, which makes her one of the easiest members to pick out from the crowd—I mean, clearly, if Jax is any indication. And finally, we have Obsidian. You’ll remember him from this episode as the guy who was able to plunge the whole battlefield into darkness and who doesn’t seem to have a face outside of a black, featureless mask. In the comics, Obsidian is the son of the original Green Lantern, Alan Scott, and a being of living shadow. He’s had some rough patches over the years (he has the unfortunate luck of being possessed by other shadow entities every now and again) and he tends to make people kind of... uneasy, I guess is the best way to put it. Apparently being around human-shaped voids of light isn’t the most comfortable thing, even for super heroes. Still, Obsidian is by and large a good guy in the comics—he even served as the JSA headquarters’ personal security officer for a while. It looks like Legends’ Obsidian is borrowing heavily from comics-verse Obsidian in terms of overall look and power set, but whether or not he’ll have the same origin and ties to the Green Lantern mythology as his comics counterpart is still up in the air. So, that’s our team! They’re certainly a little (...okay, a lot) more put together than our Legends in terms of, you know, training, and discipline, and organization, and overall skill level, which despite how annoying that may be to some of the Legends, is probably a good thing. I mean, if Baron Krieger is any indication of what the Legion of Doom has in the works, they’re probably going to need all the help they can get. And speaking of the Legion...what’s up with this amulet everyone’s got themselves all worked up about? There are no shortage of mystical amulets in the comics to pull from, but the unique name and look of this one makes me wonder—are we looking at a #DCTV Secret hidden in plain sight? Maybe a new form and name for the Amulet of Anubis? Or are we looking at something entirely new? DC Comics 101: What's the Difference Between the Justice Society and the Justice League?